The guys reunite this week to give their thoughts on the new Harrison Ford/Daniel Craig picture, Cowboys and Aliens! After, the take the time to chat about some of the movie and TV news from San Diego that was left out last week, such as a new Jurassic Park film and a Voltron reboot. Kenny reviews the new Thundercats TV show, and Blake takes the time to chat with Rebecca Marshall Ferris about her new documentary film Miller’s Tale, about the life of actor/writer Jason Miller. In the picks, Kenny goes with 50 Girls 50 #2 and Blake selects the new nonfiction tome from Grant Morrison, Supergods. Contact us with comments, suggestions, or anything else at Showcase@CXPulp.com! It’s been a lovely summer, friends, but it’s sadly almost over. For me, at least — school in Louisiana starts terribly early in August, and my vacation is rapidly drawing to a close. So let me just give a little pre-school year advice to all the students out there who will be returning to the hallowed halls of learning, be it next week or next month or whenever. Remember: the teacher is not your enemy. The teacher is there to help you, to guide you, to aid you in accumulating knowledge. We, the teachers, are not out to get you. We honestly are never happier than when we realize a student truly understands what we’re trying to teach you. It doesn’t benefit us at all if you fail — in fact, it makes our lives more difficult in numerous ways — from accounting for our grade distribution to the simple mathematical fact that it’s easier to average a bunch of 100s than it is a bunch of 26s in our gradebook. We would like to be your friend, if possible, but you have to remember that’s not our job. We’re here — first and foremost — to teach you and the other people in the classroom with you. And while we’ll bend over backward to help any student that honestly wants to learn, likewise, we quickly lose respect for those students whose only goal seems to be disrupting the learning of others. And yes, teachers are human beings. Sometimes, human beings have personality clashes. Sometimes they just don’t get along. But a good teacher is going to be professional enough to not let that interfere in the classroom. Remember: we’re not your enemy. We’re not there to destroy you or crush your dreams. Do us a favor. Treat us the same way. Later today, I’ll be recording an interview for the podcast with Rebecca Marshall Ferris about her documentary Miller’s Tale, about the life of actor/writer Jason Miller (The Exorcist).You may have seen the film — it’s currently airing on PBS stations all over the country — but Rebecca and her colleagues are trying to raise the funds to help make it available on DVD. To my surprise, part of our Maine trip last weekend included a quick trip to a small-town comic shop, prompting me to write today’s EBI about one of the greatest things in the world of a geek: the comic book Bargain Bin. Heading back to 2005, though, in the days after New Orleans’ annual Bacchanalia known as Mardi Gras, I wrote about something that I liked about Mardi Gras as a child — costumes… and about what makes a great superhero costume. One thing I did like about Mardi Gras, once upon a time, were the costumes. People don’t dress up as much as they used to, but when I was a kid Mardi Gras was a mini-Halloween, an excuse to put on masks, wigs, capes or makeup. The best costume I ever had, in fact, was a Captain America costume my mother made, complete with a cardboard shield that I painted myself. Thinking about this made me realize that Captain America really does, in fact, have one of the most effective superhero costumes there is. A superhero costume shouldn’t be about giant shoulder pads, whips, chains or trenchcoats. It should, instead, convey who the character is and what he does. The test of a superhero costume would be taking someone who has never seen him before and asking them to pick him out of a lineup based just on the name. This is what makes Cap’s costume so great – it’s simple. It’s red, white and blue. 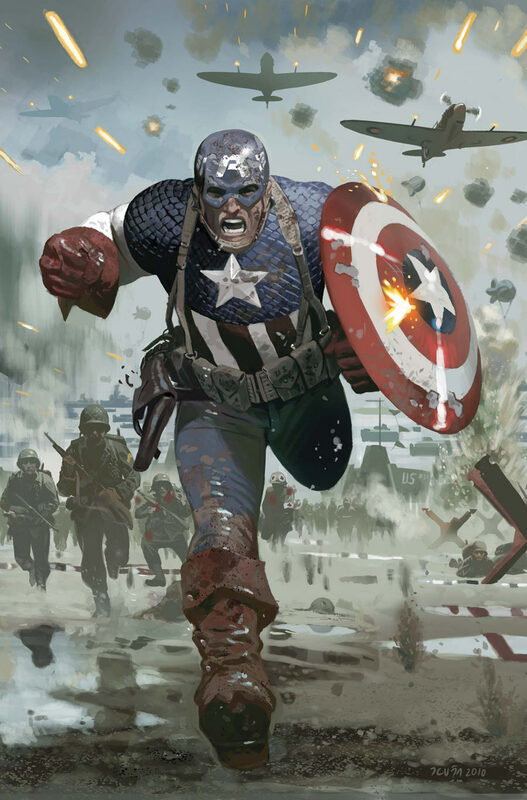 It’s got your stars and your stripes, eagle’s wings, a distinct soldierly look to the design and, just in case you still haven’t picked up on it, a great big letter “A.” Anyone could be given a pin-up of the Avengers and a list of their names and immediately be able to match which one is Captain America. Let’s compare this to one of my favorite whipping boys, Gambit. What does he wear? A purple and blue jumpsuit under a trenchcoat. It says nothing about his name, which in turn, says nothing about his powers (the ability to make stuff blow up, in case you forgot). Nobody looking at the X-Men could figure out which one was Gambit without a nametag. Not many of the X-Men have very distinctive costumes, by that account. Iceman is covered in ice, so that’s a plus, and Archangel’s wings are a giveaway. Cyclops’ visor gives him that one-eye look. Hank McCoy definitely looks like the Beast he is, but then again, that name could also be suggested for Nightcrawler or even the Juggernaut. And what about Storm, Shadowcat, Marvel Girl, Havok or Rogue? 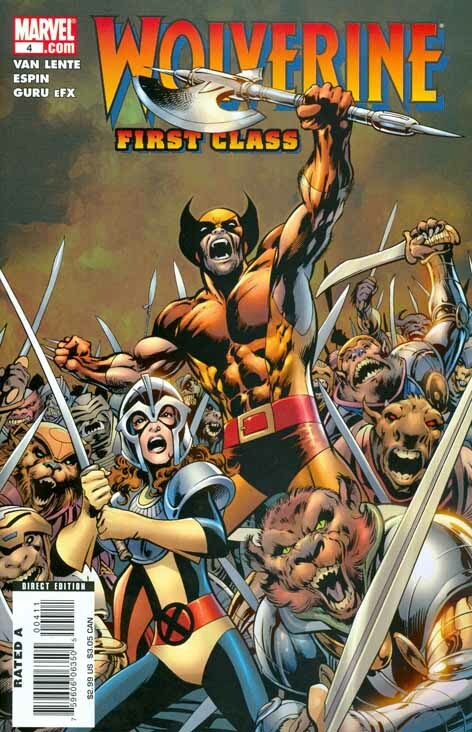 Wolverine does have something of a feral, animalistic look to him. His best costume ever, by this definition, was probably the brown-and-orange he wore for some time in the 80s and 90s. The other uniforms, although similar in cut, are blue and yellow, which only suggests a wolverine to a Michigan State fan. You have these problems whenever your character has names and powers that don’t quite mesh. What does Justice do? He’s a telekinetic. Which has nothing to do with justice. So he wears a fairly generic blue and white outfit. Spawn? He has some sort of ill-defined magical powers, and a look that has absolutely nothing to do with his name. He’s a poster child for a character with a costume that the creator would just think looked cool, without any thought to functionality, practicality or recognizability. Some characters are halfway there. The Atom has a tiny little atom symbol on his forehead, but you can’t see that from a distance, and his costume is a standard red and blue. Unless the picture of him has him standing next to something else gigantic by contrast, letting you know he’s someone who can shrink to a tiny size, you may not be able to pick it out. 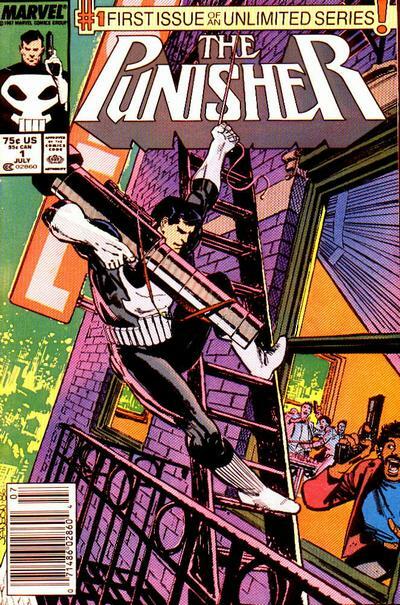 The Punisher wears black with a big white skull on his chest. Yeah, that could potentially signify punishment. Or it would make someone think of Deathstroke, Deathlok or Deadman. Cyborg is covered with cybernetic parts – half-man, half machine. A cyborg. Or maybe Machine Man. Or Robotman. 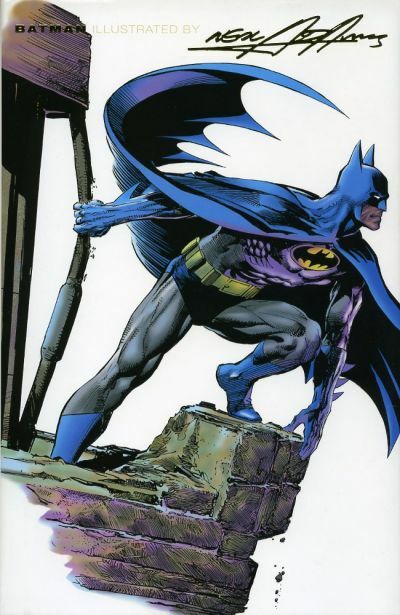 Most of the really iconic superheroes have really iconic costume designs. 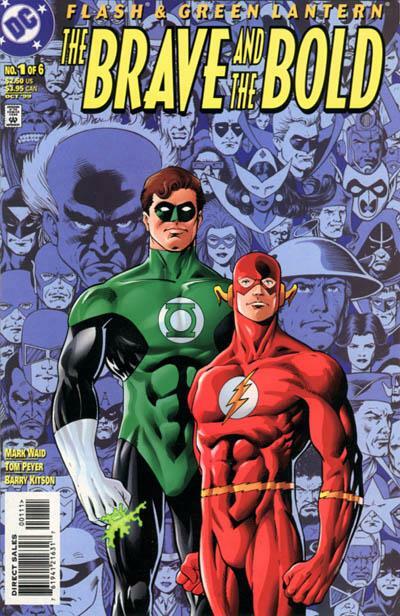 Look at the Flash – although several characters have used that name, they’ve all worn red and sported a good old-fashioned lightning bolt motif. Lightning, of course, denotes speed, and red is a very fast color. Green Lantern works too – any Green Lantern costume. They all feature the only two things you need for that costume design to work: green is a main color and there’s an image of a lantern. Bam. That simple. Even the golden age Green Lantern, whose costume has a lot of red and purple in it, has a drawing of a green lantern on his chest – a much more lifelife drawing, by the way, than the later GLs had. Color is a bonus for a lot of characters. Green Arrow? Well, if the Robin Hood motif wasn’t enough to tip you off, the color green would do it. Blue Beetle wears a blue costume with patterns and big golden eyes that suggest an insect. Simple. Red Tornado wears all red, plus he’s got a great big “T” on his chest. Initials, of course, are another time-honored method of identification, particularly for characters with less distinctive powers. 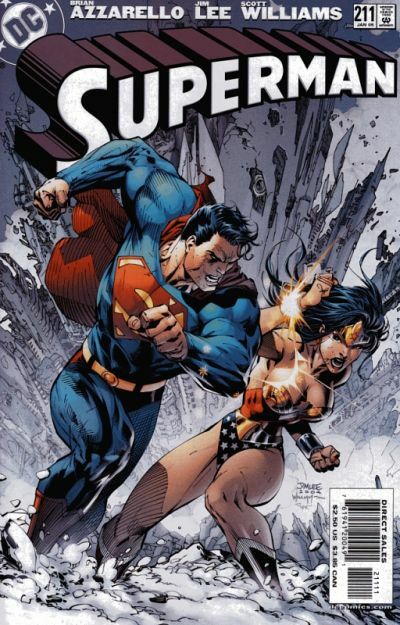 Superman and Wonder Woman are two of the most recognized comic book characters in the world, but their powers don’t really have anything to do with their names – strength, speed, flight, durability, etc. Basically, they can both do it all, which is what makes them super and wonderful, respectively. But since it’s hard to design a costume that says “this dude can do anything,” they wear costumes that look bold, proud and majestic. Bright colors, inspiring, classic designs… and on their chests, an “S” and a “W.” So if you’re looking at the lineup of the Justice League, you’ll guess Superman is the guy wearing the “S” and Wonder Woman is the one with the “W” – although she should be easier to pick out since she’s frequently the only active female member of the team. The initials also help out Daredevil, but he doesn’t need them as badly as Clark and Diana. Aside from the “DD” symbol, he wears all red, just like a devil, and even has two little horns. He’s had other costumes – a yellow one and one that was mostly black – but neither of them worked nearly as well as the classic red. Then of course, you’ve got the best costumes of all, the ones for heroes with a definite gimmick and a definite look to go along with it. Batman, for instance. He doesn’t have any powers, but he dresses up like a giant bat to scare crooks. So he has a dark costume with pointed ears and a giant, sweeping cape that comes to points like the wings of a bat – plus a picture of a bat on his chest. He looks like a bat-man. It’s an incredibly simple design, and it works perfectly. 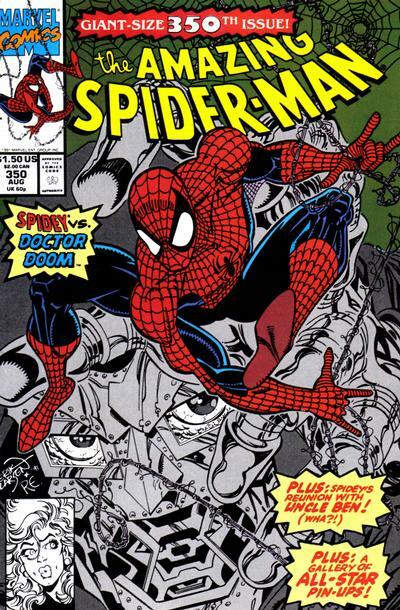 And this finally brings us to what many people say is the best costume in comics, and I wouldn’t be inclined to argue – Spider-Man. How did he get his powers? Bitten by a radioactive spider. What does he do? Well, according to the song, “whatever a spider can.” So he wears a big spider on his chest, a bigger one on his back and covers the rest of the ensemble in spiderwebs. Magnifico. All of the major characters – at least the ones known to the general public – have those kinds of simple designs, the ones that grab you, the ones that let you know at a glance what the character does. So comic creators and fans take note – if you want your superheroes to hit the big time some day, keep these rules in mind. Play it smart. Leave the chains at home. This isn’t the first time I’ve given a “Favorite of the Week” nod to DC Comics’ The Monolith, but I’m sad to say it looks like it’ll be the last. Issue #12, which came out last week, was the final issue of this fantastic comic book about a young girl who inherits a house with a secret in the basement – a giant stone golem. This last issue doesn’t end the story of Alice, her best friend Tilt and the mystical protector they found, but it does bring it to a great resting point. The last line of the issue is one of the most profoundly heartfelt of the series. If you never read this title, go out and find the back issues, then write to DC and make your voice heard. Runaways got a new lease on life due to fan response – there’s no reason it couldn’t happen for this incredibly worthy series as well. Blake M. Petit is the author of the superhero comedy novel, Other People’s Heroes, the suspense novel The Beginner and the Christmas-themed eBook A Long November. He’s also the co-host, with whoever the hell is available that week, of the 2 in 1 Showcase Podcast. E-mail him at BlakeMPetit@gmail.com and visit him on the web at Evertime Realms. Read past columns at the Everything But Imaginary Archive Page. 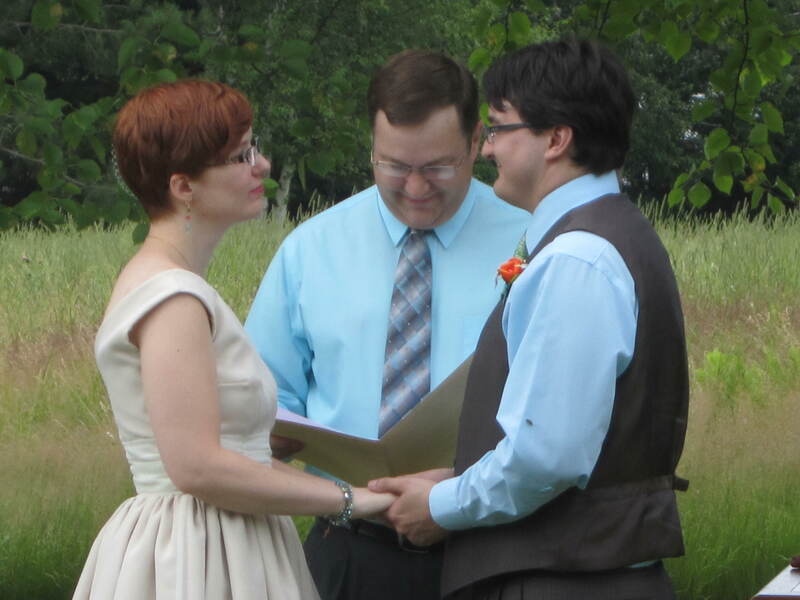 This weekend, as you may have heard, I darted off to Maine for the wedding of some friends. Erin and I had a wonderful time with old and new friends alike, and except for the gargantuan hassle that I went through trying to get home (by the way, US Airways is horrible), I couldn’t have been happier. Erin has posted all of the pictures we took to her Facebook page, but for the sake of you who’d like to see them and aren’t among her Facebook friends, I’ve added them to my own Flickr album. Go ahead and take a look. Lovely weekend in Maine for a friend’s wedding. Nice flight in to Boston, where I was supposed to catch a connecting flight to Charlotte, which in turn would get me home. Flight cancelled. Apparently there’s weather cancelling flight aaaaaaaall over the Eastern Seaboard. I spend a half-hour in line at “Special Services.” This is an incredibly inaccurate name for this particular counter. With just one couple left before me, the woman at the counter announced she’s leaving and everybody left will have to go out, past the security gate, and go to the main ticket counter to get helped. Stand in another incredibly long line. I find out I can’t get a flight that will get me home until 6:30 tomorrow morning. (It is, at this point, about 7 p.m.) But it’s okay, because the information booth downstairs is “really good” about helping “distressed passengers” find hotel rooms. I go to the information booth and find out there’s no hotel rooms available! Yaaaaay! I break down and resign myself to spending the night in the airport. I’m told I can’t go back through security, where the decent places to eat and at least relatively comfortable accommodations are, because my boarding pass isn’t until tomorrow. I find a place to sit down. Go to hell, US Airways.